New York Grapes. Concords I believe, though it's been several years so I may be remembering wrong. 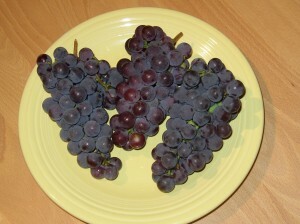 The answer (I had to look this up myself) is that grape breeders can dissect out the seeds of immature grapes (before they abort) and use tissue culture techniques to grow them in a lab. The technique is called embryo rescue and it’s used effectively in lots of situations where plant breeders otherwise can’t get viable offspring. Once a breeder develops a tasty and hardy new breed of seedless grape, multiplying it for distribution is easy, since almost all grape vines grown today are already produced using grafting. Why do “regular sized” grapes look so teeny to me? Oh that’s right, b/c the ones we have at home now are the genetically engineered ones. I’ve actually fairly familiar with the grape genome, it’s one of the better assembled plant genomes and is great for doing comparisons to other eudicot species since it hasn’t gone through any further duplications since the ancient hexaploidy of eudicot plants. For example one genomic region in grape matches up to four separate regions in Arabidopsis, a species that has gone through two more recent rounds of whole genome duplication. But enough about genomics. 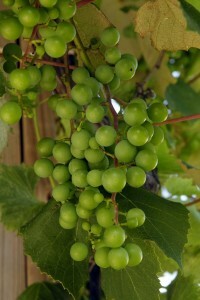 Grapes were originally domesticated in the Mediterranean. People have been making wine from them for thousands of years. The Odyssey talks about Odysseus and his men making wine from grapes at several points. ** Wine making is still the primary use of grapes grown everywhere from famous wine regions (like California and France) to good but obscure ones (like the finger lakes of New York) to the truly unexpected wineries (like Iowa). *As with any complicated system there are a lot more ways to break grape embryo development than for it to work successfully. Posted in: Crop Profiles, Plant breeding, Plants.